The aspen tree is one of the most widely distributed species of tree in North America. Yet in the urban landscape, an aspen tree has a life expectancy of barely 20 to 25 years, according to the Colorado State University Extension. Aspens grow in a clump from a dense root system. If you purchase a single aspen tree from a garden center, it may have been pulled from this dense mat with only a small portion of its root system still intact. With attentive care, you can keep your aspen healthy, strong and long-lived. Select a spot for your tree that is in full sunlight. Aspens will do well if located on the north or east side of a building where they receive morning sun and evening shade. Purchase an aspen that has been grown at a nursery. These trees have more extensive root systems and are healthier than trees that were collected in the wild. Dig a planting hole that is slightly larger than the root ball. Mound up a small pile of dirt into the center of the hole. Turn the aspen tree onto its side, if it is in a pot, support the trunk with one hand, and tap the pot with the other to release the root ball. If the tree is in a burlap bag that encloses the root system, untie the bag and remove it from the root ball. Place the root ball into the planting hole on top of the pile of dirt and cover with dirt that you removed from the hole. Do not bury the aspen tree too deeply. The top roots should be within 2 or 3 inches of the surface of the soil. Mulch your aspen tree with pine bark or pine straw. Aspens thrive in slightly acidic soil, so using an acidic mulch will benefit the plants. Control insects around your aspen tree by spraying the leaves with an insecticidal soap. Prune weak undergrowth branches by cutting them away from the trunk at a 45-degree angle. This will increase circulation in the aspen tree’s canopy and reduce the occurrence of fungus and mold in the trees. Also prune any dead or diseased branches as they occur. Watch for signs of common diseases that affect aspens, including canker spots, which look like orange pimples. Remove an aspen parent plant from your landscape as it starts to develop dead wood and a thin crown. This will make room for the smaller trees that shoot up from the root system to grow and thrive. 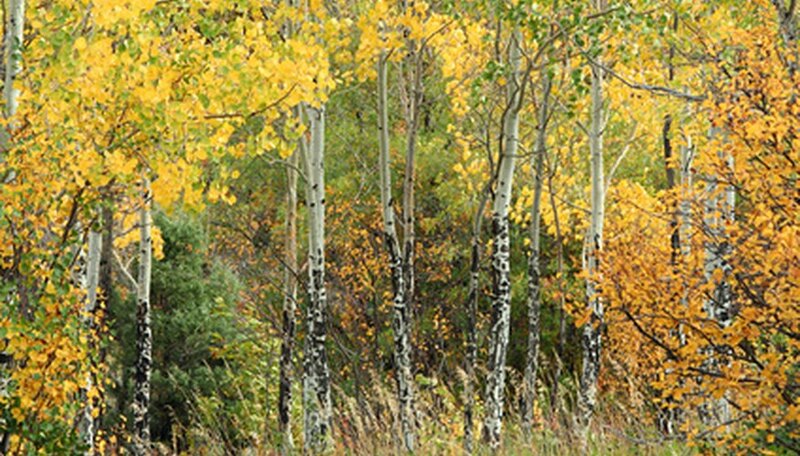 Aspen trees do not like to have waterlogged roots, and they do not thrive if planted in heavy clay soil. You can have your soil tested by taking a core sample to your local extension service to determine if its structure is heavy in clay. Break up clay soil by amending it with gypsum and with organic material such as peat moss and finished compost.